We continue our summer looks at some places that we have checked out in autumn, with a look at the SPECTACULAR High Knob Overlook. Here is an article from an autumn visit we made to this place. 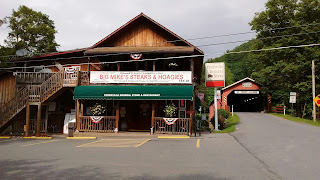 It is located near Worlds End State Park in Loyalsock State Forest. This area is so remote that it is actually dark skies rated by the International Dark-Sky Association. You can see for at least twenty miles from this overlook on most days, and up to forty miles away on clear days from a vantage point that is roughly 1200 feet from the lowest point on the valley floor. The views here are captivating and incredible from this overlook that is roughly 1200 feet above the valley floor. 80 percent of Loyalsock State Forest, roughly 90,000 acres of land open to recreation for all Pennsylvanians, are visible from this location. While this overlook is incredible with its summer greenery, it is even more incredible with fiery autumn colors. My last visit to this place was during a spectacular autumn sunset. Our last stop takes us to Dry Run Falls. It is certainly a pretty little waterfall, and worth a stop on your way out from the High Knob Overlook and Worlds End State Park. There is a nice little picnic area next to the falls if you would like to have a picnic lunch next to the falls. Today we take a summer look at the Marie Antoinette Overlook, and the Wyalusing Rocks Vistas, overlooking huge bends in the majestic Susquehanna River near Towanda in Bradford County, PA. We visited these last fall, and wanted to check them out in the summer. This article on the Marie Antoinette Overlook and French Azilum gives a look into the fascinating history of this spot, and shows this location in the autumn. This article shows a look at Wyalusing Rocks in the fall. Seeing the difference in these locations with the seasons is incredible. The history in this location is just fascinating. The late 1700s were the beginning of the end of colonial expansion. The Americans stood up and won independence from Great Britain. It can be argued that this was the beginning of the end for British imperialism. This ripple carried over to the French soon after. During the French Revolution, the French dealt with similar uprisings both domestically and abroad. The natives and imported slaves of Haiti successfully revolted and became the only successful slave uprising that resulted in a new nation-state in the new world. The French elites fled from there, just as they were fleeing from the mainland in France. Seeing the plight of the exiles, for whom the Americans had allied with just a few years before, they allowed for the creation of a village in rural Pennsylvania, near Towanda, within a horseshoe bend of the Susquehanna River. 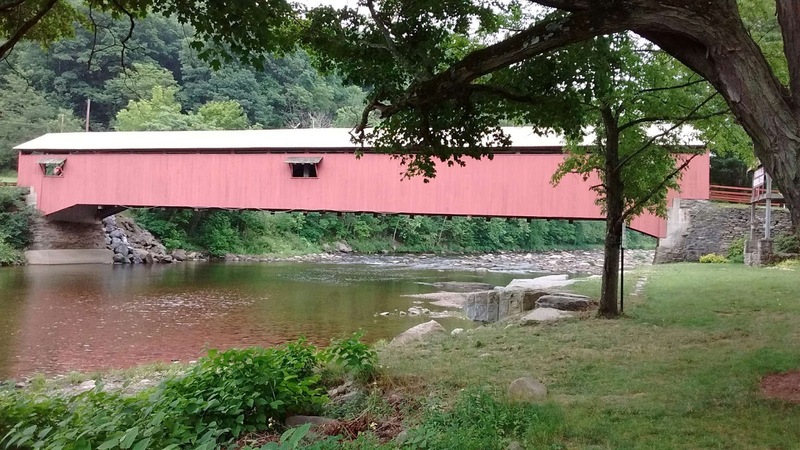 The history is fascinating, but still pales in comparison to the natural beauty of this spot along historic Route 6. There is a nice pull off area at the top of the bend, with a great overview of the history of this location. A cutout that enabled Route 6 to travel through this spot. Now we head a few miles east along Route 6 to beautiful Wyalusing Rocks. This article gives some autumn views from this spot, and some historical background. The bend is a little smaller in this location, but a beautiful rock outcropping enables the terrific views that you can get from this bend. Because of this outcropping, it has remained an important location through all eras of human inhabitance in the area. Downtown Erie is beautiful and filled with lots of gems. As a city with very old industrial roots, and as a crossroads of transportation, the city is filled with lots of 19th and early 20th century buildings and relics. We will start off with the fantastic Spencer House Bed and Breakfast, where we stayed on this visit. This charming victorian mansion is a great place to stay, especially if you love old and historic buildings. This place has been meticulously restored to its past elegance. Next we look at a random iron pole that almost looks like a street light that got sheared off. It has a much deeper spot in the history of Erie as a nautical city. Any guesses? Ding, ding! You guessed right! It is a drive shaft from a steam ship! It dates back to the 1830s and it came from the flagship for the Reed Steamship Lines, the S.S. Thomas Jefferson. It stands outside of the Erie Club, an exclusive place located in the mansion of one of the wealthiest men of his era in Erie, General Charles Manning Reed. I was really taken with the beauty of this building. I knew right away that this was an old hotel, likely from the 1920s, and that inference was correct. This building its the Richford Arms and it dates back to 1928, when it was built and opened as the Ford Hotel and it was later known as the Hotel Richford. Now it is has mixed usage, no longer as a hotel. It is still great to see that the building remains. Some of the beautiful buildings of downtown Erie. The old Edison Electric Fountain in Perry Square. Looking towards the Bayfront and Downtown Erie at Dusk from Presque Isle State Park. Here is the Erie Firefighters Museum, covering the history of this critical group of individuals that keeps our society safe from the threat of fire. This is one of multiple small and medium sized museums throughout the city that are pretty neat. The Warner Theater is another amazing gem. This beautiful Art Deco and French Renaissance-styled theater dates back to 1931, when it was opened by the Warner Brothers. The Warner was the main movie palace of the city. It was donated in 1976 to the city, where it now serves as a performing arts center. The churches in the city are particularly stunning. The city's old Union Square/Griswold Park Post office. It dates back to 1932 and is located very close to Union Station. This old post office even has a tunnel built into it for mail delivery from train service. While the building is no longer used as a postal station, it is now utilized for offices. And speaking of Union Station, what an incredible building. It is still partially utilized as a train station, in addition to offices, retail space, and the Brewerie at Union Station brewery and restaurant. This old station, which was a joint effort between the New York Central and Pennsylvania Railroads, is still used by Amtrak's Lake Shore Limited line, which runs from New York City/Boston to Chicago, via Albany, Syracuse, Rochester, Buffalo, Erie, and Cleveland. Throughout downtown Erie you will see fantastic views, in addition to several chocolatiers and breweries. We had an excellent trip to Erie, and highly recommend checking out all of these gems, in addition to Presque Isle State Park, the shores and lighthouses of the area, the railroading and museums, the wineries, Waldameer Amusement Park, and more. Waldameer is one of our happy places. We love going to this charming amusement park, with its great rides, atmosphere, and the world-class Ravine Flyer II wooden roller coaster, unaminously rated in the top tier of all wooden roller coasters on the planet by roller coaster enthusiasts. One ride on Ravine Flyer II and you understand why. It is a beautiful park, located in a beautifully forested bluff over Lake Erie and Presque Isle Peninsula. In German, Waldameer translates into "woods by the sea," and that moniker holds true to this day. Ravine Flyer II, as seen from the Tom Ridge Environmental Center observation tower, with the blue waters of Lake Erie in the background. They were able to pack a full sized roller coaster on two small plots of land on the bluffs surrounding Peninsula Drive. As soon as you get to the top and see the fantastic views of Lake Erie and the Presque Isle Peninsula, and then get whipped down that wicked first drop, you understand why this coaster is so highly regarded. As soon as you get to the bottom of the first hill, the train crosses a bridge over the four-lane Peninsula Drive in what serves as one giant airtime hill. Once you get to the other side, the train goes through a heavily twisted set of curves and drops and then it crosses back over the bridge. Then the train traverses a series of strong airtime hills and into a 90 degree curve and through a series of more out-of-control curves and more airtime hills. There is not one dull moment in the 2900 feet of track that make up Ravine Flyer. Since the coaster opened up in 2008, it seems that the coaster has gotten even better with age. Being into roller coasters and having visited many amusement parks, to the point that we have even written a book about Pennsylvania Amusement Parks, we can attest to how incredible Ravine Flyer II is. Waldameer is worth a visit for Ravine Flyer II alone, but the park also has two other great family coasters, the spinning Steel Dragon roller coaster, and the classic Comet. Comet is one of the last coasters designed by the famed Herbert Schmeck of the Philadelphia Toboggan Company, the man responsible for many classic roller coasters throughout the country. This was built to be a family coaster, so it does not have the intensity of many of his other designs, but it still is a very fun little ride. For families, the park has a good number of pint sized rides that will be sure to please the little ones, including many little rides like this, plus Ravine Flyer III, a little coaster that is a hit with the little ones. Additionally, they have an excellent train ride that goes through the park. 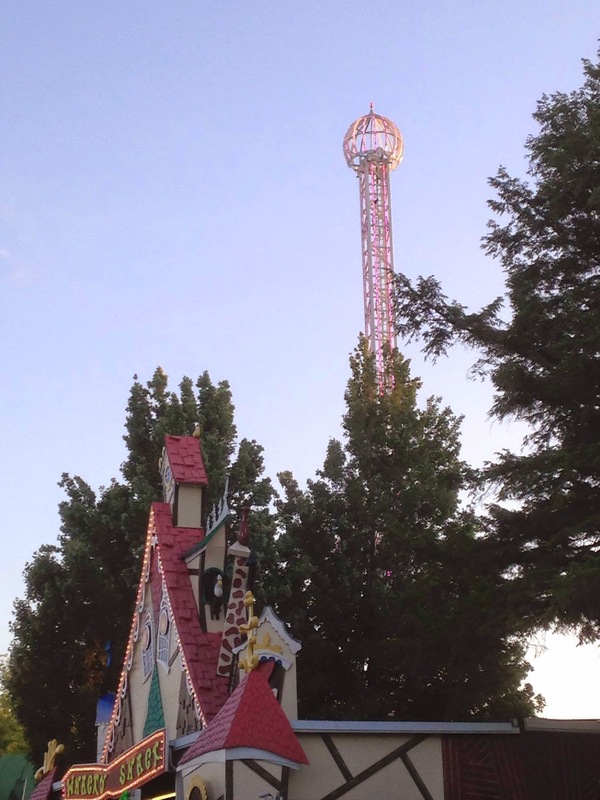 The park also has a number of nice thrill rides that cater to people of all ages. The entrance midway has seen the most updating recently, with the new installation of a Music Express and Scrambler, and the addition of a large wavepool and new slide complexes in their waterpark, in addition to the park's lazy river, lounging areas, and other waterslides. The waterpark has nearly doubled in size over the last few years. The park has many classic rides, such as this paratrooper. And this large ferris wheel, placed at one of the highest points in the park, providing tremendous views all around. The view of Presque Isle Peninsula, the bay, and Lake Erie from the top of the Ferris Wheel. Even with all of the new additions, the park still retains its classic and relaxed feel, with vintage rides, delicious park food and treats, shaded groves, and lots of midway games. While Waldameer is not a huge park, the park is pretty much perfect as it is. The staff meticulously maintains and updates the grounds, and somehow finds a way to make their park better each year. This has always been a family park and it is an absolute gem. Now for a ride on the sky ride. It gives a nice leisurely ride over the heart of the Waldameer midway and gives nice views of everything, plus Lake Erie. The Steel Dragon spinning roller coaster is slightly in view in this shot. Heading over the carousel pavilion and the entrance area to the park. Now headed back around to amazing views of Ravine Flyer II. The Battle of Lake Erie water play area is under construction, and will be the latest addition to the waterpark lineup. Two of the most prized possessions of the park are their two haunted attractions Whacky Shack and Pirate's Cove. This genre of rides is referred to as "Dark Rides," and both were designed by an absolute legend in that field, artist and designer Bill Tracy. Not much of his work remains, so these two attractions are priceless. Whacky Shack is a haunted ride that was built in 1970, and Pirate's Cove was built in 1972. Bill Tracy passed away in 1974, so these were some of the last attractions that he created. Bill started off making Macy's Thanksgiving Day parade floats in New Jersey, and then he eventually got started making legendary dark rides on the Wildwood Boardwalk. From there he went around the country and built famous attractions at places like Coney Island, Asbury Park, and both Ocean City, MD and Ocean City, NJ. Laff in the Dark has a terrific write up on the life of Bill Tracy if you would like to know more about this designer. Waldameer has not just one, but two intact Tracy attractions, and the only remaining Whacky Shack ride. Waldameer is an absolutely excellent amusement park that offers something for everyone. It is a great park and worth going out of your way to visit. When coupled with Presque Isle State Park, and everything that Erie has to offer, you have more than enough to do to fill a weekend trip or extended vacation.